Popular American golf pro Phil Mickelson has won the 2013 British Open at Muirfield in Scotland with an impressive five under par 66 for the final round on a bleak and windy golf course which has been around since the beginnings of the game of golf. Mickelson scored birdies of 4 of the last 6 holes to take a commanding lead even before sinking a long putt for a final birdie on 18. This was a first ever win of the British Open for Mickelson who started the tourney listed at 20-to-1 odds to win with Tiger Woods holding on as the favorite despite his recent troubles. 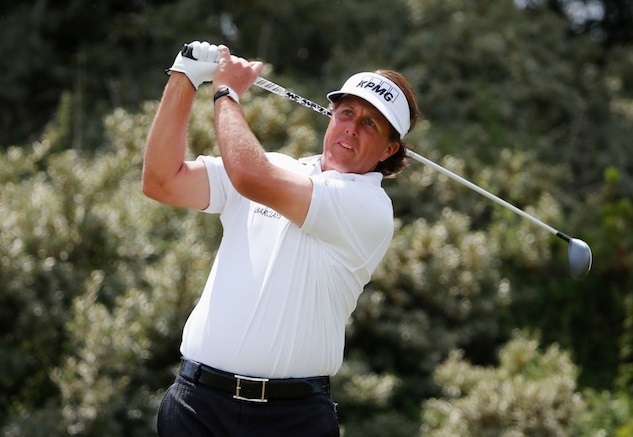 Mickelson is known as ‘Ole Lefty’ out on the links and has been a crowd favorite for years. Lefty has somewhat of a reputation for coming in second after blowing a lead on the final holes but, not so at Muirfield where he put in one of the most memorable rounds of golf in recent memory after starting the day five strokes off the pace. Lefty’s performance on the brown links of Muirfield will be talked about for years to come are one of the greatest rounds of golf ever played in a major tournament. Tiger Woods was the all around favorite to win the Open at 8-to-1 and he was actually in the running during the early holes of the final round but ran into problems in the middle of the course and ended up 4 over par for the day. Just as the green jacket is the symbol of the Masters Tournament, at Muirfield victory is symbolized by lifting the Claret Jug and Sunday marked three consecutive years in a row that a golfer of at least 40 years old has lifted the cup. It was Mickelson’s fifth major victory and one that must have come in a particularly satisfying after his melt down at the recent U.S. Open at the demanding Merion course. British favorite Lee Westwood started the final round as a 7-to-4 favorite but he too ran into trouble in the middle of the course and faded from competition with a 4 over for the day while countryman Ian Poulter shot a 4 under on the final round pulling himself up into a three way tie for third place with Westwood and Adam Scott.